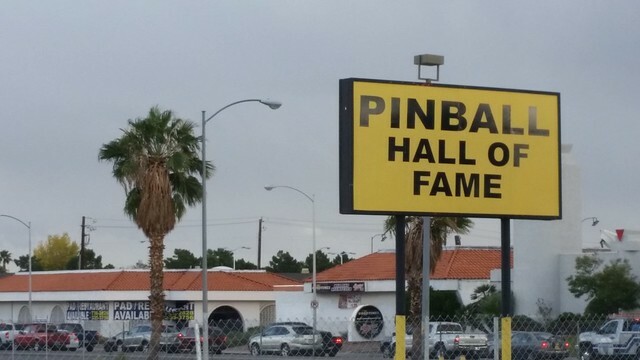 In a relatively nondescript building on Tropicana Blvd not too far from The Strip is a pinball-lovers paradise. This photo shows only a small part of the huge collection of machines here. And this isn't a static museum: all the machines in current working order can be played. There's a collection of older and newer machines, including a couple of the newest ones, but with the emphasis on older, historical machines. The Hall of Fame is located across the street from the former Liberace Museum (the building shown for lease in the distance.) Lisa and I spent between $10 and $20 playing games of various sorts for several hours. 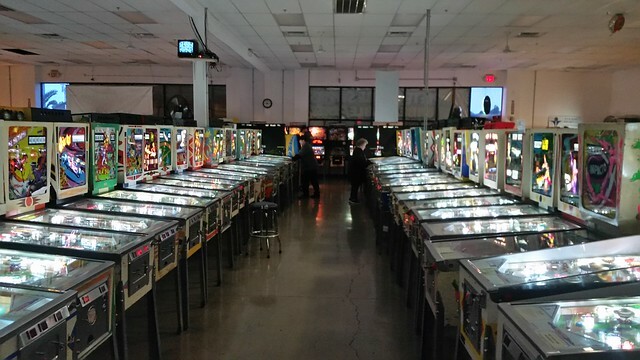 It's a pity there isn't a comparable collection closer to us in Reno, and that it is so difficult for us to get to this collection, as there are machines here that we've known and loved. There are a couple here that Lisa would like to buy, but they aren't selling. By the time our legs expired (standing on a concrete floor for hours), it was after dark and we decided to go see the Fremont Street Experience, which we've never visited before, as we've always stayed in hotels along The Strip, which strictly speaking isn't actually in Las Vegas anyway. 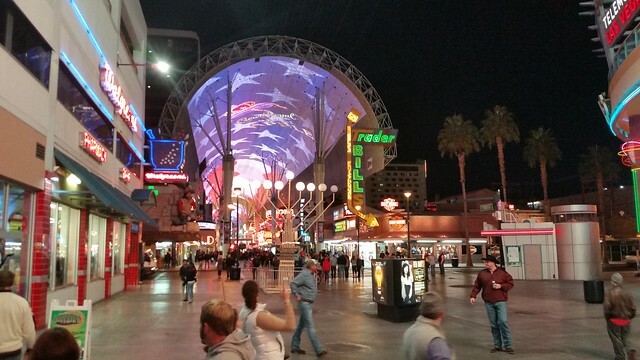 The Experience is several blocks of downtown Las Vegas which has been roofed over to provide a continuous light show. 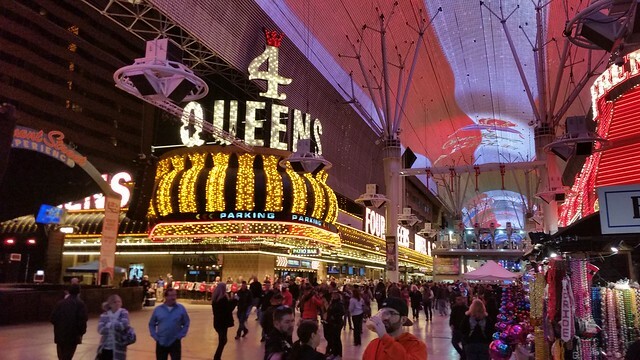 It's a pedestrian mall now, full of light and sound — actually too much sound, as it rapidly grew way too loud for Lisa and we took refuge in one of the casinos. It's a sign of just how loud it was when a noisy casino floor seemed to be a haven of peace and quiet by comparison. 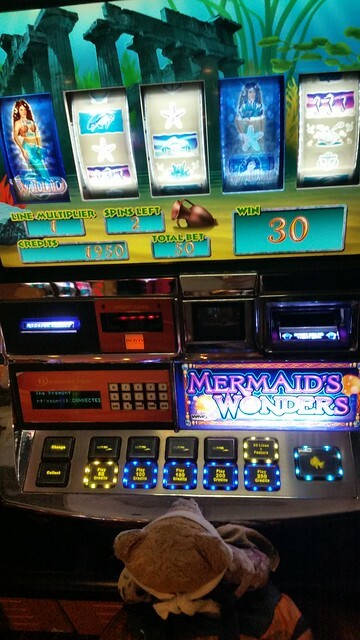 While Lisa used the restroom, travelswithkuma played one of his favorite slot machines: Gold Fish. On the very first pull, he hit the bonus round and was money ahead. Unfortunately, we ended up not stopping while we were ahead (our usual pattern) and ran through $20 rather quickly. The money we spent on the pinball machines was better entertainment money. 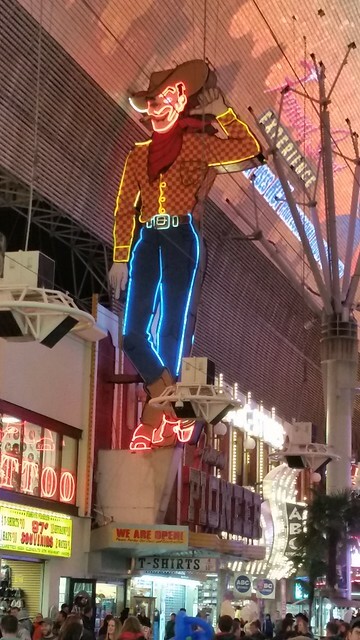 Some of the most iconic images of Old Las Vegas are here on Fremont Street. We signed up for the slot club at one casino and played long enough to collect the $5 in free play (which resulted in $2 in actual money) and to validate our parking, but between already being tired from standing in the pinball palace much of the day and being overwhelmed by the sound in the Experience, we were ready to call it a night, even though it was only about 8 PM. Lisa drove us back to the relative peace and quiet of the Palazzo and managed to also find a good parking space close to the garage elevators that will make it easier to move out in the morning. We then went to the adjacent Walgreens for drinks for Lisa and bit of food for breakfast in the room in the morning. I also bought my sister some Las Vegas chocolates. 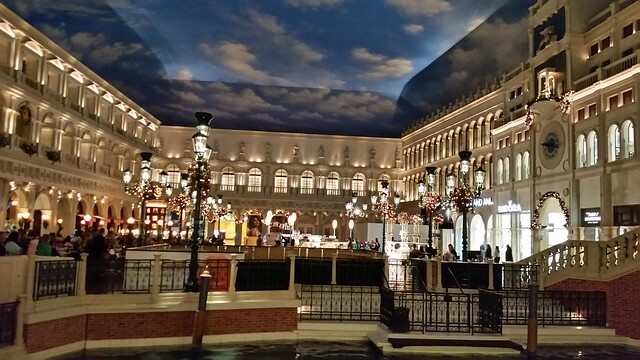 As we went back into the Palazzo-Venetian complex, we went into a pizza restaurant on the casino level and ordered a large pizza to go, then returned to the hotel room. 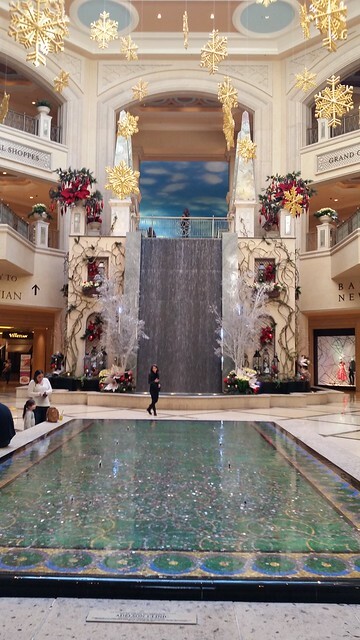 This lovely fountain and pool is on the ground level between the Palazzo and the Venetian. When Lisa sent me back to collect our pizza, my path took me by the fountain. Earlier, we had walked along the Grand Canal Shops and bought me a new hat from a shop that had been kind to Lisa yesterday. The views along the walk are very striking. 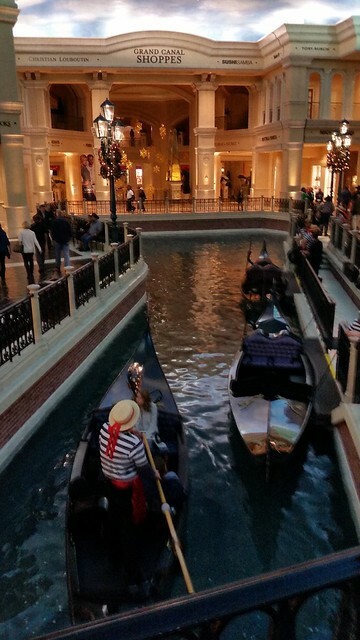 There's even a Venetian-style canal boat ride along the shops. We considered taking the ride, but $24/person for a 15-minute boat ride in a glorified shopping mall seemed a bit much to us. I retrieved the pizza and brought it back to the room (more than a 1 km round-trip according to the pedometer), and we gratefully chowed down on dinner. Tomorrow we need to get off to a relatively early start because we're backtracking to Boulder City to ride the Nevada Southern Railway in Boulder City, and we'd prefer to take the first train, which is at 10 AM, to give us plenty of time to drive to Tonopah tomorrow. I'm glad we aren't going to try and drive all the way home tomorrow and that we aren't like the clerk at Walgreen's who thought that Reno was a 3 or 4-hour drive from Las Vegas, which only shows that she's never made the trip. Nevada's highways can be pretty fast, but not so fast that you can average 150 miles per hour driving between the state's two largest cities.